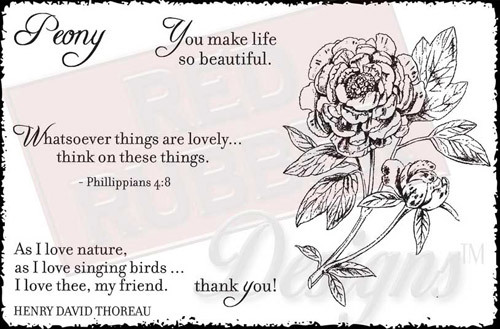 Perfect name for this LOVELY peony stamp, and such wonderful sentiments! I'm off to the hop to see what your fabulous design team has in store for us! And thanks for the chance to win this set! This is a beautiful stamp set. I'm hopping along to everyone's creations and thanks for the opportunity to win this gorgeous set. LOVE this set!! and Ever So Thankful. I have no idea why I love fall images so much ... but I do and that collage is wonderful! Good to see a couple of oldies as well. I just uploaded an older Seeds of Blessings card to Flickr. So sorry. I have no idea how I posted this comment on the wrong post. I couldn't figure out how to delete it off the Oct 2 post. Have a great weekend! Love this set and glad to have it available again! Thanks for the chance to win it as it is definitely one I would like to have.